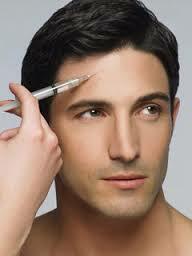 Growing conscious of their looks there has been a rise in cosmetic procedures for men. Most appealing treatments can simply be brushing away those crows feet and frown lines by having anti wrinkle injections and dermal fillers to achieve a more youthful appearance. This can be a minor upkeep be done in the work lunch hour. We can do a lot of things without resorting to surgery which is more appealing to men. According to data from the British Association of Aesthetic Plastic Surgeons (BAAPS), the number of cosmetic operations conducted last year fell 40% to a near-decade low from a record-breaking high in 2015. For instance, although women still account for 91% of cosmetic procedures in the UK, the number of men opting for Cosmetic Surgery has almost doubled in the past decade – having gone from 2,440 treatments in 2005, to 4,614 in 2015. Notably, Male Breast Reductions rose by 13%, whereas male facial procedures were up by an average of 14-15.5%. More men are aware they can achieve fantastic results whilst returning to work the very same day with a small ‘tweatment’ being is very appealing. We can now do a lot of things without resorting to surgery and this attracts more men. Those who wouldn’t want a face lift because they didn’t want the downtime and time off work, are having facial lasers, tightening treatments, tread lifts and so on.